In this workshop you will learn how to make this simple, sweet little chunky book using only watercolor paper, found metal & embellishments. The book is approximately 4 x 3 inches. 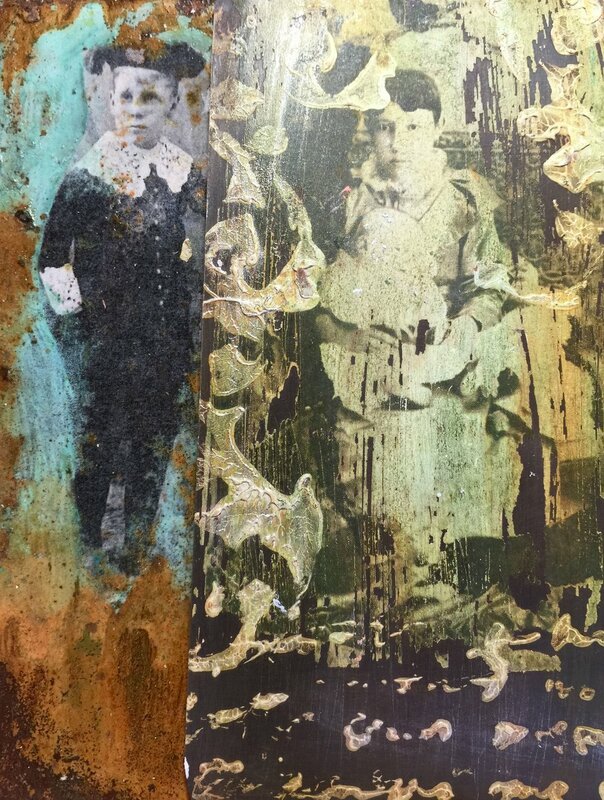 You will learn how to work with found metal, how to create beautiful textures and surfaces using gesso and ink, as well as distressing, punching, altering, and cold connecting. Join us for a fun day of art making & use this book to record your special dreams, goals, & thoughts that are close to your heart. In this workshop you will learn how to make an eclectic free standing figurative assemblage, starting with only two pieces of wood & a few of your favorite treasures! You will learn the nuts & bolts of assemblage, composition, cold connecting, and how to unite found objects to create a cohesive piece of art. You will learn a cool new way to distress wood surfaces, I will teach you how to make my clay faces, and how to make a mold of just about anything. We will drill, sand, carve, paint, sculpt, problem solve, punch & distress...but most important, we will have a blast! Breathe new life into your found treasures and join us for a fun day of constructing these awesome, one of a kind assemblages! I’m not sure why but I’ve always been drawn to texture & old worn surfaces... yes, peeling paint, splintering wood, rusty stuff & stucco all hold a special place in my heart! In this workshop I will teach you how to create the look of these old, grungy, fabulous surfaces using plaster, wax, gesso, ink & glaze, all non-acrylic mediums to create a rough, matte surface. We will begin with twelve 6 x 3 inch canvas cards for a total of 24 surfaces & spend the day learning how to mark, resist, scrape, carve, rust, mono print, imprint texture, layer and stain. You will learn how to easily create patterns using rust & how to make multiple prints with a geli plate. I will also teach you how to incorporate & transfer images, and how to work with color, composition & texture. So jump in & get your hands dirty! No experience necessary, just come with an open mind, a playful heart & leave your critic and ideas of perfection at home! You will leave with a fabulous body of work in deck form, use these individual pieces as a guide, or bind with ribbon & hang. This is a fun, relaxed workshop suitable for everyone with all levels of experience. We will be working with a no bake clay that will be secured to a small canvas, texturized, and decorated with found objects, paint & ink. You will learn composition, object placement & design skills, as well as how to add texture, depth, strength & stability to your work. I will also demonstrate a quick & easy way to make a mold of just about anything. Join us for a fun day of playing with clay, you will leave with at least 2 finished pieces, 3 if you work fast. boatload of brand new ideas & techniques! You will leave with a unique, beautifully embellished art deck that can be bound by decorative wire or transformed into a book or sculpture if you wish. In this workshop we will create our very own imaginary village using a variety of techniques to build thick deep layers on canvas. We will use paint, paper, fabric, fibers, found objects and gel to create amazing depth & dimension. Learn many new tips & tricks including how to obtain a beautiful encaustic look without using messy hot wax & crock-pots. Please join us for a fun, relaxing day of inspiration & art making! This is a project oriented workshop. You should be able to leave with at least one finished canvas, 3 if you work fast! 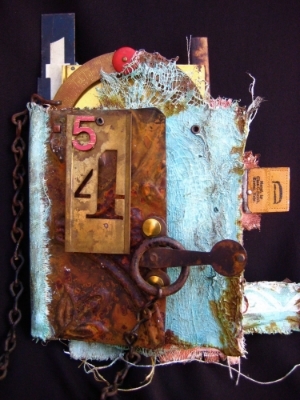 In this workshop, you will learn how to transform remnants of canvas & metalinto this sweet little art book. This project is appropriate for everyone, whether you are just starting out or an accomplished artist, it can be as simple or as complex as you’d like. The actual construction of the book is very simple & requires no sewing or math skills. The book measures approx.. 5x5, but will most likely be larger after addingtabs, pockets & found objects. In addition to learning how to construct this book, you will learn how to create yummy surfaces with texture & depth, how to integrate your images with paint & design, and how to add tabs, pockets & mini books. You will also learn alternative methods for connecting found objects without using glue. Use this book to document your travels, or any other relevant event in your life, it will be treasured for years to come. I just love to create beautiful texture, and this one is all about texture, contrast & color! In this workshop we will create a gorgeous one of a kind shrine (2 if you work fast!) using fabric scraps, clay, paint, ink & scrap wood. You will learn all about composition, object placement, mold making, fabric sculpting, and a variety of techniques to create gorgeous textures. My shrines are all approximately 8” x 6”. Please join us for a messy, fun day of art making! In this basic assemblage workshop, we will be working with some of my favorite materials: gesso, clay, fabric, paint & found objects. While learning to unify diverseelements and other forgotten bits and pieces, we will work to create a gallery quality assemblage piece, or your own unique personal shrine. Consider enshrining a favorite deity or ancestor, commemorating an important event in your life, or just letting the materials inspire your creativity to wherever the muse leads you. In this light hearted and exploratory workshop, you will learn several valuable mixed media techniques, including surface altering, distressing& design processes, cold connecting objects with hardware and wire, object placement& many other assemblage tips and tricks. You will be able to incorporate these techniques into many other aspects of your own work. Not quite sure what to do with the mounds of junk....oops...I mean, treasures that have been accumulating in your studio? Have you been afraid to use that vintage tin, saving it for the “perfect” project? Well dig it all up & bring it to this class, where we will create the wackiest flock of birds you’ve ever seen! Add to your cold connecting, assemblage & composition skills, but most of all, learn how to let go of perfection, let loose & have a blast! Many of us are drawn to texture & old worn surfaces... peeling paint, splintering wood, rusty stuff & stucco all hold a special place in our hearts. In this workshop you will learn how to create the look of these old, grungy, fabulous surfaces using plaster, wax, gesso, ink, glaze, and non-acrylic mediums to create a rough, matte surface. We will begin with nine 10 x 5 inch pages for a total of 18 surfaces. You will learn how to mark, resist, scrape, carve, mono print, imprint texture, layer, stain & how to easily create patterns using rust. We will experiment with creating multiple prints using a Gelli plate, and I will teach you how to incorporate & transfer images and how to work with color, composition & texture. Take your art to the next level by incorporating these simple, easy techniques in your paintings, collage, journals, assemblages or just about any creative project. You will leave with a luscious, chunky 5 x 5” book. So jump in & get your hands dirty! No experience necessary, just come with an open mind, a playful heart & leave your critic and ideas of perfection at home! Ahh, 2 days to explore surface design & bookmaking! Get ready to play, laugh, learn and have a blast in this informative, messy workshop. You will learn how alter paper & metal as well as how to make a sweet chunky book using only watercolor paper, canvas, metal & embellishments. On day one, you will learn how to create gorgeous surfaces that will be used as the pages for your book. We will experiment with stencils, stamps & inexpensive household found objects to create yummy textures. I will introduce you to resists, glazes, gesso & ink to create depth, contrast & stunning color combinations. You will learn how to make magic out of imperfections, and how to make room for more happy accidents. In the afternoon I will teach you my absolute favorite techniques for creating interesting surfaces on metal, including metal transfers & leaf printing, which will later be used as the covers for your book. These are tried & true techniques that I use on most of my art work, whether it be assemblage, book design or figurative sculpture. On day two, we will tie it all together to create a beautiful 5x7 inch book. I will teach you how to bind this book as well as how to work with found metal, distressing, punching, altering, and cold connecting. You will leave with a beautiful book to fill with your cherished memories, photographs & writings, along with all information that you need to create more. I created my first Spirit Protectors during a particularly difficult time in my life and I can’t seem to stop. I absolutely love making these & I would love to teach you how! On day one of this two day workshop, I will teach you my favorite surface design techniques on metal. We will explore leaf printing, faux etching, texturizing, metal transfers, and I will bring several products that will add solid color to your metal. We will prepare our wooden bases & create cool funky faces for our figures. On the second day I will share my favorite tips & tricks to achieve balance, contrast & a powerful composition. We will cut up our tin, combine it with the metal that we made on the first day & I will show you how to make beautiful woven pieces out of metal strips. You will learn simple cold connection techniques, no glue here, as well as how to safely & properly operate tools. Finally we will put it all together to create two figurative assemblages attached to a wooden base. Each base is approximately 5”x7” which is used for the body only. After adding the head & legs your Spirit Protector can be as large as your imagination can take you! You will leave with at least one finished piece, however most people complete 2 in this workshop. No experience necessary, just plan to come & have a blast! In this workshop I will teach you how to create this funky, functional book with multiple size pages, pockets, folders and envelopes to store your secrets and goodies. 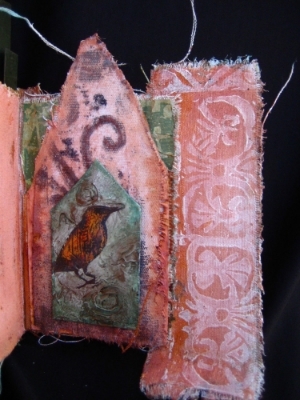 Learn simple bookmaking skills as well as a variety of collage and surface design techniques using gesso, ink, glaze & paint with non traditional mark making tools. These make excellent travel journals or special individual books to house your memories from a special event. The final book will be approximately 9” x 7”. I hope you can join us for a. fun creative day of art making! I call my tin figurative assemblages “Eeeps” and I have been making these for the past 15 years. Each year they seem to grow, change and morph into something different and this year is no exception! In this inspiring workshop we will be using an empty tin for our base, as we do in my “Faux Etching” workshop, only this time we are using completely different materials and techniques. In the morning we will begin by using a two part clay to create one of a kind faces for our Eeeps. I will demonstrate a quick & easy way to make a mold of just about anything and I will have my hand made molds available for you to use. From there we will move on to leaf printing. Leaf printing on metal was a happy accident that I discovered after using metal instead of tiles to hold eco dyed paper. I spent months perfecting this technique and I finally have it down to where I can teach it without using pots of boiling water, since hotels tend to frown on this! We will attach our favorite leaf print to the cover of our Eeep, and you will have extra to take home for other projects. The rest of the afternoon will be spent constructing unique figurative sculptures using the metal that we altered, our new faces and found objects. While working on the sculpture, we will cover basic cold connection methods as well as composition & design. In the evening we will work on the inside of our sculptures, creating a small book or whatever else you can imagine inside the belly of your Eeep. You will leave with 2 figurative sculptures and extra materials to create a third at home. Your final Eeeps will be approximately 12” x 6” after adding found objects. The tin itself measures 4” x 1 1/2”.